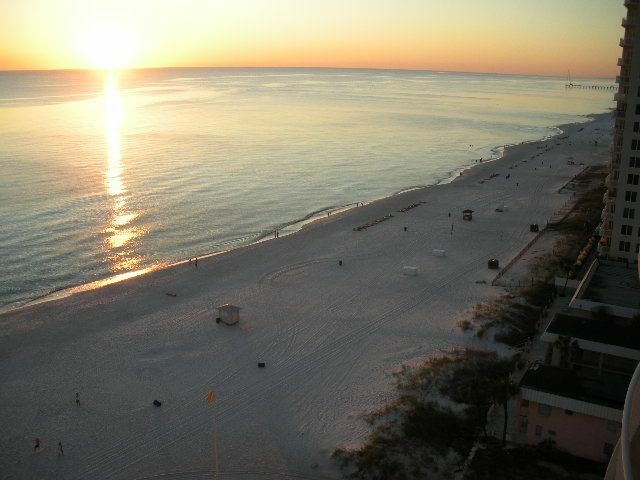 Ocean Villa is located right on the beach in the middle of Panama City Beach. The 125 unit complex was built in 2006 and features 2 pools, a large hot tub, steam room, sauna, exercise room and 200' of white sand beach. Extra large balconies offer beautiful, panoramic views of the Gulf of Mexico. Covered parking, easy access, 24 hour security and 3 high speed elevators complement the many other features of the resort. This 2 bedroom/2 bath unit has been recently updated with new stainless steel kitchen appliances, couches and rugs, 55" curved TV and Breezesta patio table and chairs. The living area and the master bedroom both open onto the balcony through oversized, full view sliding glass doors. * Fully equipped kitchen with granite countertops. * Living area with leather sofa, love seat and new Samsung curved 55" flat screen TV with DVD. * Dining table with 4 chairs. * King size bed in master bedroom. * Flat screen TV's and full dressers in both bedrooms. * Free high speed wireless internet. * Furnished balcony with table and 6 chairs, settee and chaise lounge. * All linens and towels provided. This unit number 1305 is located right in the middle of the building. Not too high and not too low. It's very nice throughout and will make for a great vacation. Please, absolutely no pets and NO SMOKING! We purchased this condo as a retirement home. We thought we would share this beautiful condo with other people to enjoy and have a great vacation. This is a place I would like to vacation in. We fell in love with the beautiful beaches. It feels like home but at the beach. The balcony is wide and spacious and a great place to sit and watch the waves roll in. A hairdryer is provided in each bathroom. Towels and washcloths are provided. There is nothing better then to sit on the balcony and look over the white sand and blue water and listen to the waves meeting the sand. All doors must be closed when using the air conditioning or else the unit will freeze. Along with bath towels, we also provide 6 beach towels for your use. There is a small fitness room on the 3rd floor which has a Treadmill and a exercise bike with a great view of the ocean while you are exercising. There is a leather sofa along with a love seat that provides plenty of seating for everyone. All dishes, utensils, pots and pans along with bakeware and casserole dishes are provided. There is also 4 chairs at the counter for extra seating. 55'' Big screen Curved TV in living room and smaller TV in each bedroom. There are some beach toys for smaller children, cards and tic tac toe game. Has table and chairs for 4 people, 1 chaise lounge and double settee to enjoy the sun and ocean view. There are numerous golf courses close by. There is a list of names and address' inside the condo. We have 2 beach chairs, beach umbrella, beach blanket, cooler, and 6 beach towels for your use. This should be your 1st choice! Condo was amazing! Beautifully furnished, huge balcony, spacious, clean, hot tub, cold pool & warm pool, grill area, sets directly on the beach & front beach rd, owner was extremely helpful & kind. Nice dishes, pots & pans—I loved her kitchen! She has thought of everything. She lets you borrow her beach gear & there’s a stationary beach chair for the unit outside. We will definitely be back! This condo has everything you need to have an awesome vacation! My little family enjoyed stay in this condo. I will definitely use it again!! This condo had everything you could need. Perfect location and the owner is very responsive and helpful. Would absolutely recommend this condo. Thank you Jennifer for the review and taking care of our condo. Sorry that your vacation was cut short due to hurricane. This was by far the best condo experience that we have ever had in Panama City! Marilyn the owner is an absolute pleasure to work with and is always quick to respond to any questions or concerns. Her condo is exceptionally clean, beautifully decorated with quality furnishing, and very well maintained. The balcony, my personal favorite, is large and offers an amazing view of the beach. Ocean Villa's property is also very well maintained, provides ample parking, sparkling clean pools, and is located close to area shopping, restaurants, and attractions. Thank you Marilyn, we had a absolutely fantastic family vacation and will certainly be back again next year. Thank you Jeff for the great review. The best part of renting is th fantastic people we come in contact with. The condo was in great condition and in a good location for our stay. Thanks again we will be back. We are located close to Pineapple Willy's and Walmart.